Home » Stories of Success » Gardening » Spring Garden Forum Thrives! The Spring Garden Forum had a thriving turn out on April 1, 2017. 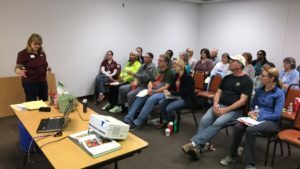 We had gardeners from all walks of life who are interested in improving their green thumbs, and getting the most out of their gardens. The event was free and open to all, and we will have another one soon. If you are interested in attending future events, or helping out, contact our Garden Administrator Shelley Barlow.